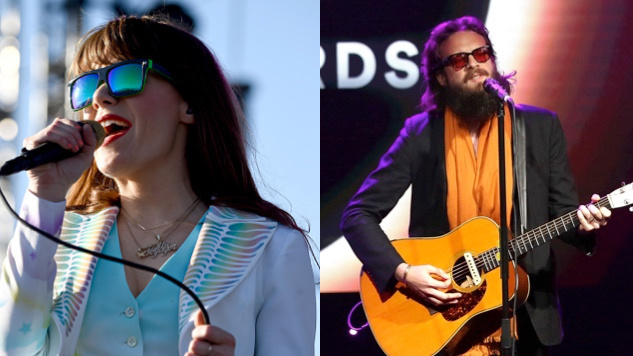 Watch Jenny Lewis Join Father John Misty on "God’s Favorite Customer"
God has a new favorite customer. Indie-Americana artist Jenny Lewis joined Father John Misty onstage in Toronto this weekend to perform the title track from his 2018 album, God’s Favorite Customer, and she crooned out the mid-tempo tune like a practiced Misty back-up singer. Watch the pair perform below. Father John Misty personality Josh Tillman is currently touring behind God’s Favorite Customer through September, dates for which you can find here. He released the album in June and has since shared a number of music videos and rollout-related hoopla. Most recently was his animated video for “Date Night,” which looks like a psychedelic trip meets Adult Swim cartoon (i.e., an Adult Swim cartoon). Watch that here. Lewis also supported Tillman on a few dates earlier in the tour. She just appeared at Newport Folk Festival last week and has several more dates lined up the for the rest of the year, including providing support for Beck at Red Rocks. Find all of Lewis’ dates here and revisit her 2014 album The Voyager with our review here. Read the Paste review of God’s Favorite Customer, Tillman’s fourth LP as Father John Misty. While you’re here, listen to Father John Misty’s 2012 Daytrotter Session down below.